Our friends at Blue Sky Factory have put together their top ten list of eMail marketing best practices and have been kind enough to allow us to carry the post. It’s a great post by Nikki Schiavone and we thank them for it! Btw, make sure you comment and say “hi mom!” because apparently Nikki is so excited about us carrying this, she is printing out ten copies for her mother (Dr. Hook & The Medicine Show ref. intended)! 2009 has been a whirlwind year filled with emails regarding presidential promises, celebrity gossip, economic adjustments, and technological and collaborative growth. From learning about the discovery of water on the moon to the significant changes and advancements in the many facets of life, my inbox has been anything but boring this year. The change that has occurred, specifically on the business front, is something to embrace and learn from. As an email marketer, I’ve learned that our clients see the success they want through utilizing a combination of fundamental best practices while embracing the technological and economical changes around us. The fundamentals are the backbone of any great email marketing program. The saying, “it takes a village to raise a child”, holds true to email marketing. It takes an accumulation of specific email marketing best practices to produce a successful campaign. Needless to say, email has come a long way in the last ten years. Blasting and spamming is no longer the thing to do (not that it ever was, but people did it anyway). With the CAN-SPAM Act, industry guidelines, and professional email service providers, marketers now have what they need to succeed. 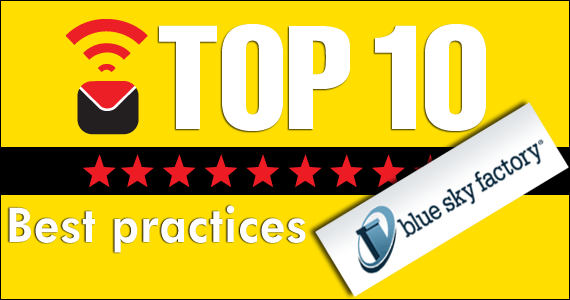 Below is a list of the top ten email marketing best practices of 2009, in no particular order since they are all important and have helped our clients exceed their goals and previous performance levels. What better way to move into 2010 than with an email marketing checklist for success fromyour team at Blue Sky Factory? Subject Lines– You never get a second chance to make a first impression. A subject line is one of the first opportunities to WOW your subscribers. Use this opportunity to be creative, a bit avant garde, descriptive, authentic, and honest. Want to know more about improving your subject lines? Find out what Director of Community DJ Waldowhas to say about it. Opt-in Forms– Opt-in forms gather a subscriber’s personal contact information. It’s important to place opt-in forms on prominent areas of your website for optimal list growth. Opt-in forms should affirm the type of email communications that will be sent and disclose how email addresses will be used. Check out“Opt-in Forms: They’re Not That Simple…”from Client Services Manager Elena Hekimian. Deliverability & Reputation– Work with a professional email service provider that uses a stable infrastructure (likePublicaster). Send your email to organically opted-in email lists with a consistent mailing strategy for improved email deliverability. Evaluate your performance, test your campaigns, optimize your content and subject lines. Bottom line, improve your deliverability and your reputation will follow suit. For more detailed information, listen to Chief Compliance Officer Dr. Steve Lucas’s webinar,“Permission-Based Email Marketing: Privacy, Preferences & Best Practices”. For more information about deliverability, check out my recent blog post,“Master Deliverability Best Practices for Inbox Success”. Template Designs– Your email template is a direct reflection of your website, your brand, and the personality of your company. If your template looks stale, outdated, and uninteresting, how does that make your brand look? Now is as good a time as ever to put an end to stale templates and create fresh, new-and-improved templates. In doing so, you’ll improve click-through rates, deliverability, retention, and ROI. Learn aboutChris Brogan’s template refresh. Call to Actions– BUY. CALL. CLICK. READ. OPEN. LISTEN. WATCH. Give your subscribers something do with the emails you send. Make it clear why you are sending emails and what specifically you want them to do when it hits their inbox. Be explicit – again, make it easy. Need some ideas on how to keep it fresh for 2010? Read more in Senior Client Services Manager Joanna Lawson-Matthew’s recent article,“Top Ten Ways to Accelerate Your Email Marketing Strategies for 2010″. Organic List Growth– Save the trees, use email, grow it organically, and remember quality beats quantity any day of the week. Send a welcome email after subscribers opt-in, customize your content based on subscriber preferences, and give your subscribers what they want. Check out what Support Director Melanie Sims has to say aboutorganic list growth the right way. Build your list before the sale, attend events, host events, don’t be afraid to use the phone, complement your email marketing communications with other marketing communications. See what Marketing Manager Amy Garland has to say aboutbuilding your list offline. Content –Having a great product or service to market is fabulous, but actually being able to tell its story is something different. Great content is what your subscribers are looking for. Test out the layout of your content, change up your authors, do some research on industry trends, educate yourself with what your subscribers want, study buying habits, study engagement habits, and try to change things up. The best problem to have is TOO MUCH content; you can always take some away. TEST!– Email is an art not a science. It is imperative that email marketers allot a significant amount of time to create test lists to test content and campaigns. I recommend using an email marketing tool that offers automated testing within the application, like A/B split testing. A/B split testing allows for marketers to select the best possible message to send subscribers. By testing the content, from address, subject line, images/copy, placement, call-to-actions, and layout, you’ll improve your subscriber engagement, conversion rates, and ROI. For more information about A/B split testing, check out Vice President of Sales John Kirk’s article,“Marketers Toy Box: Automated Split Testing”. 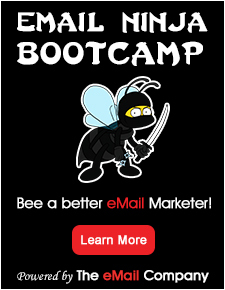 I challenge you to let 2010 be an opportunity to improve your email marketing fundamentals. Email is the glue that holds the web world together, and it’s the number one most used channel for business communication. Learn how to maximize this channel and it will give you an return on your investment like you wouldn’t believe. Thanks for all your support from you and your team. Having a post on the The Email Guide is truly something to aspire to, so I appreciate everything! Great post Nikki! Thanks for being a part of our fantastic community here at The eMail Guide!